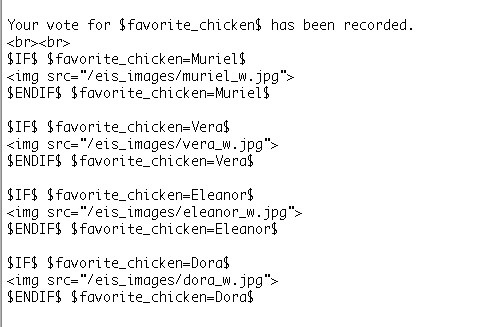 Once again we are going to vote for our favorite chicken but this time we will look at the response pages and how to personalize them using the data collected from the form. When you set up the form you can specify the full URL of pages that you would like to use for the response and error pages. These should be pages on your website. The form missing and form error pages are typically the same page. You will need to generate the code. If you are updating a form that you already installed on your website you only need to add or update the 3 lines of code for the hidden fields redir, formmissing and formerror. Now when you cast your vote for your favorite chicken and you forget to enter all required fields you get an error page that tells you what fields are missing. Where ever the tag $ERROR$ is placed on your error page is where the list of missing fields will be inserted. When you have successfully cast your vote for your favorite chicken you will see the response page that is specified when you set up the form and appears in the redir hidden field. While this can be a nice page on your website it doesn’t use any of the information from the form to personalize the page. To use the ERROR tag discussed above or to personalize the page you need to request to have Relevant Tools turn on remote templates so that the page that you specified can be used and the information from the form can be inserted where you specify. There is no charge for turning remote templates on. 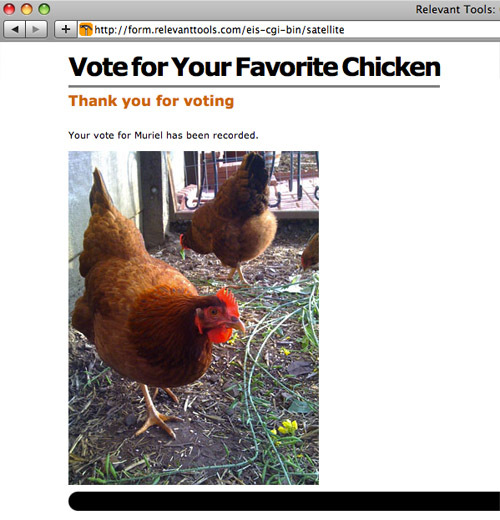 Here is the personalized response page from when we voted for our favorite chicken. Here is an example of the code that can be used to personalize your page. This example is testing for each value entered on the form and displaying the image for that particular value. There are a lot of different options available for personalizing your pages and we can help you setup your response pages so that they work for you. There is one more very important step to making personalized response pages work. You must use a base tag in the header of your response page so that your images and style sheets can be found and your links will work properly. Have fun personalizing your pages and don't forget to vote for your favorite chicken.